Piatra Neamț ([ˈpjatra ˈne̯amt͡s]), German: Kreuzburg an der Bistritz, Hungarian: Karácsonkő) is the capital city of Neamț County, in the historical region of Moldavia, eastern Romania. Because of its privileged location in the Eastern Carpathian mountains, it is considered one of the most picturesque cities in Romania. The Nord-Est Regional Development Agency is located in Piatra Neamț. The piatra toponym (meaning rock in Romanian) was always part of the settlement's name throughout its history. Other names that the city has been called are: Piatra lui Crăciun (Christmas Rock, thus also corresponding to the Hungarian name of the city, "Karácson-Kő"); Târgu Piatra (Rock Fair, Rock Market) (in the Middle Ages) or simply Piatra to which was added the county name Neamț (Neamț = German), to distinguish it from towns in other counties of the same name. Piatra Neamț lies in the Bistrița River Valley, surrounded by mountains - Pietricica (590 m), Cozla (679 m), Cernegura (852 m), Bâtca Doamnei (462 m) and Cârloman (617 m), at an average height of 345 m (1,131.89 ft). The city is located 350 kilometres (217 miles) north of Bucharest, in the historical region of Moldavia. The nearest airport is Bacău, situated at 60 km (37 miles) south. Piatra Neamț is linked by Romanian railway trunk number 509 to Bucharest and Iași, and by DN15 national road to Bacău (therefore DN2 to Bucharest), Iași, Suceava, and Târgu Mureș (Transylvania). Of these, Ciritei, Doamna and Văleni are formally separate villages administered by the municipality. There are plans to build two new districts, the larger of which will be on the site of the former Reconstrucția factory. The area around Piatra Neamț is one of the oldest inhabited areas in Romania. The oldest traces of human civilisation in the present territory date back to the higher Paleolithic, about 100,000 years BCE. The Cucuteni culture, whose development lasted approximately one thousand years (ca. 3600-2600 BCE) was attested in the territory of Neamţ county by a remarkable number of settlements (approx. 150), archaeological diggings unearthing important museum collections of Aeneolithic artifacts. Archaeologists have also discovered objects here dating back to the Neolithic Period and the Bronze Age (about 1900-1700 BCE). Excavations just outside the city revealed the ruins of a large Dacian city, Petrodava, mentioned by Greek geographer Ptolemy in the 2nd century. The whole compound had its heyday between the first century BCE and the first century CE. Standing out is the citadel at Bâtca Doamnei which contains shrines resembling those identified in the Orăștiei Mountains. As far as the existence of a local leader is concerned, historians tend to suggest the identification of the Kingdom of Dicomes in the very political centre at Petrodava. The complex of strongholds without peer in Moldavia and Wallachia is evidence as to a powerful political and military centre both in Burebista’s time and in the period that preceded the reign of Decebalus. The settlement was documented in the 15th century as Piatra lui Craciun, or Camena, a market town. The first urban settlements, which emerged under Petru I Mușat (1375–1391), were Piatra lui Craciun, Roman and Neamț. The Neamț citadel, whose documentary attestation dates back to February 2, 1395, was also erected during the same consolidation period of the Moldovian pricipate east of the Carpathians. The Princely Court of Piatra Neamț is mentioned for the first time in a document dated April 20, 1491, to have been founded between 1468 and 1475, under Stephen the Great, the Princely Cathedral being built in 1497-1498, and the 20 m (65.62 ft) tall Bell Tower in 1499. As of 2011 census data, Piatra Neamț has a population of 85,055, a decrease from the figure recorded at the 2002 census, making it the 24th largest city in Romania. The city's industries include a fertilizer plant, a pulp and paper mill, and several food-processing plants. In the city are also located an agricultural machinery plant (Mecanica Ceahlău), a pharmaceutical plant (Plantavorel) and two paper manufacturers. The city's main industrial park is situated 11 km (7 mi) south, in the Săvinești area. During the communist period, the Săvinești platform was one of the most important chemical plants in Romania and the site of a research institute. Today, the industrial facility is part of the Italian group Radici, and it operates at low capacity. In the recent period, the most important Romanian commercial brands originating from Piatra Neamț are Rifil (synthetic fibers manufacturer), Altex (Media Galaxy) (TV, hi-fi, home appliances national dealer), Köber (paints manufacturer), Amicii-Kubo Ice Cream (ice cream producer) and Dasimpex (mobile phones dealer). There are 4 local TV stations (TV M, 1TV, TeleM, Actual TV), 3 FM radio stations and several newspapers, including online newspapers such as CityNeamț and Ziar Piatra Neamț. Piatra Neamț is home to Teatrul Tineretului (Youth's Theatre), G. T. Kirileanu library and many cultural events, including the International Theatre Festival in the springtime, the classical music event Vacanțe muzicale (musical holidays) in the summertime and more folkloric festivals all year round. The "Petru Rareș" national college, "Calistrat Hogaș" national college, National College of Computer Science as well as "Victor Brauner" Fine Arts College are some of the most prestigious education centres in the Neamt county. Starting with January 2009, Piatra Neamț is the host of a short film festival called "Filmul de Piatra" (derived from the name of the city "Piatra" which means stone (rock) and translated as "Stone-film Festival"). The 1st edition took place in the building of Teatrul Tineretului and other locations between 7th and 11 January 2009. The festival has a national short film competition (all genres) and awards each category. The agenda also includes selections of international shorts, awarded in major festivals throughout the world. Other special programmes include live concerts, skiing and workshops. The city's main attractions are the natural beauty of the area (the mountains and the lakes), the historical buildings, the museums and the festivals. Today, there are several programs in progress with the goal of transforming Piatra Neamț into an important touristic destination in Romania (the construction of the cable car and the wintersports facilities). FC Ceahlăul Piatra Neamț is the local football (soccer) team; best performance : 4th round in UEFA Intertoto Cup in 1999 after two matches versus Juventus Torino. Former Fibrex Săvinești, actually HCM Piatra Neamț is the local men's handball team, three times champions of Romania and two times winners of Handball Romania's Cup. VC Unic Piatra Neamț is the local women's volleyball team. 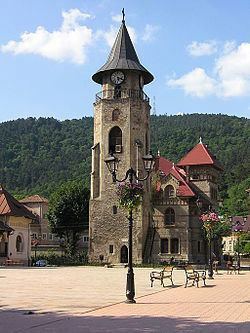 Piatra Neamț is the residence of Constantin "Ticu" Lăcătușu, the first Romanian alpinist who reached the top of Mount Everest. The Piatra Neamt Equestrian Stadium (Baza Hipică) is the host of several show jumping and dressage international competitions. In honor of this city an asteroid has been dedicated to the city of Piatra Neamț, by Alfredo Caronia, an Italian amateur astronomer, living in Piatra Neamț, co-discoverer of the asteroid.